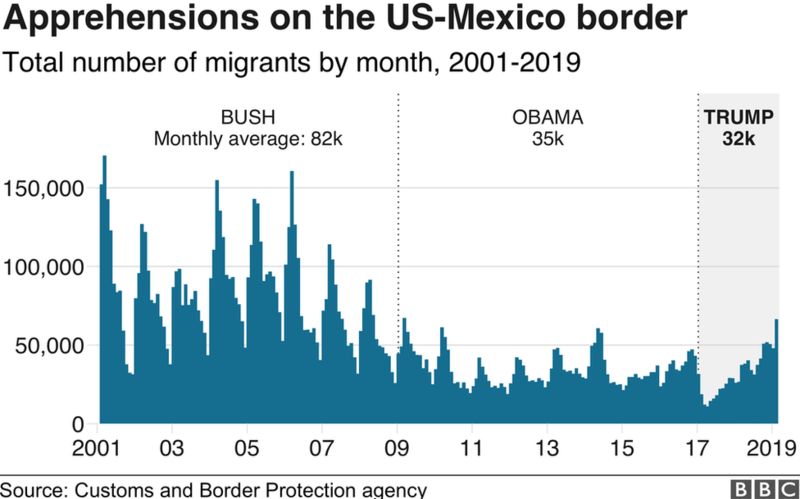 The US-Mexico border has reached "breaking point", US officials say, amid an "unprecedented" surge in migrant numbers. Customs and Border Protection (CBP) Commissioner Kevin McAleenan said it is "a matter of time" before tragedy strikes at one of their facilities. 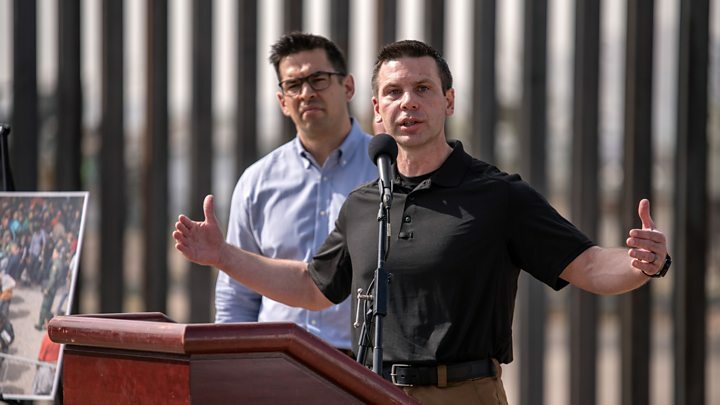 "On Monday and Tuesday, CBP started the day with over 12,000 migrants in our custody," Mr McAleenan said at a news conference on Wednesday. "As of this morning, that number was 13,400. A high number for us is 4,000. A crisis level is 6,000. 13,000 is unprecedented." 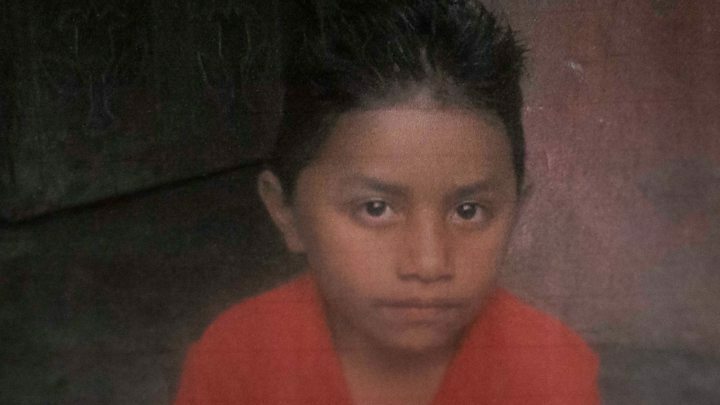 But because these are family units and children, they cannot be easily repatriated and instead, are "almost guaranteed to be released to remain in the US indefinitely". Mr McAleenan said his agency expects 40,000 children to enter CBP custody in March after entering the US unaccompanied, "in the hands of violent and callous smugglers". "We are doing everything we can to simply avoid a tragedy in a CBP facility," he added. "But with these numbers, with the types of illnesses we're seeing...I fear that it's just a matter of time." CBP officials are on pace to manage over 100,000 migrants this month - the highest in a month since 2008. The images from El Paso are dramatic. Men, women and children huddle behind chain-link fences, with only the most rudimentary of services. 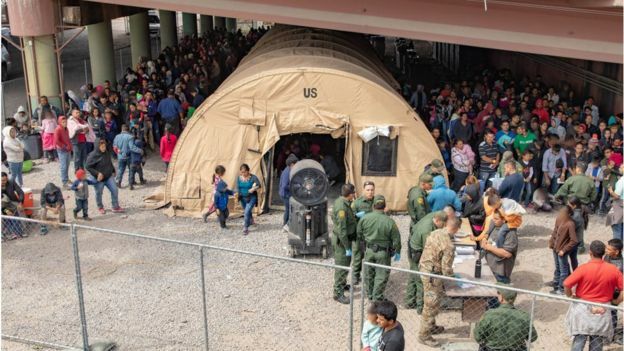 Donald Trump has called the border situation a "crisis" - and while the families crossing into the US at a growing rate may not be the national security threat he describes, the potential for a humanitarian emergency is real. The challenge for the US government is that there is no clear way to end the refugee tide without changing US law, which allows migrants to claim asylum from anywhere on US soil. Mr Trump's much-touted border wall - which already largely exists in El Paso - is ineffective, because it can't be built on the Rio Grande river, the actual border separating the US and Mexico. Refugees can complete their 1,000-mile journey from Central America by wading into US territory. This could put Democrats in a bind. For months they've criticised Mr Trump's warnings of border chaos as anti-immigrant hysteria. The debate over immigration has hardened into partisan trench warfare. The situation, however, is changing. If Democrats don't acknowledge this - and offer solutions - they risk finding themselves on the wrong side of public opinion and in the midst of a growing political storm. The agency has now redirected 750 agents from their roles at ports of entry to instead support the "humanitarian mission". "We have in some sectors an average of 40% of our Border Patrol agents all fully engaged in just the care, transport, and processing of migrants." US President Donald Trump last month declared a national emergency at the border, in order to tap into funding for a US-Mexico border wall. But Democrats argued he has manufactured a crisis at the border to fulfil a campaign promise, bypassing congressional authority in the process. News of the dire situation at the border comes as "the mother of all caravans" is reportedly forming in Honduras. Mexican news outlet El Economista reports that this latest group of migrants travelling to the US could have more than 20,000 people. Mexico's Interior Minister Olga Sanchez Cordero told local media an estimated 900,000 migrants will make their way through Mexico towards the US border by the end of 2019.